Woo hoo! I'm popular! 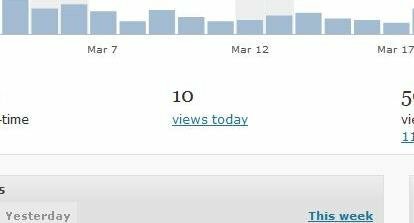 100 views in a single day! I somehow have 100 views, and it’s not even my lunch break! Look at that beautiful, towering bar on the right, dwarfing my other days stats! People love me and my entirely inappropriate posts about breasts and pubic hair! 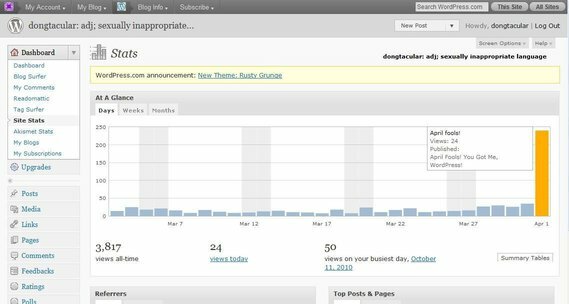 After a quick victory dance to Disco Duck (which was conveniently playing on the radio at the time), I sat down to assess why I was suddenly a moderately successful blogger. Hold on, only 10 views today? Ok, so there must be some glitch in the stats. That says I only have 10 views, but the graph shows that I have 100. The graph must be correct, right? Oh, wait. It’s April 1st. April Fools Day. And I am the fool. Did anyone else fall for this? EDIT: I now have nearly 250 hits today! Although, it says April fools in bold when you hover over the bar. Damn fake stats. 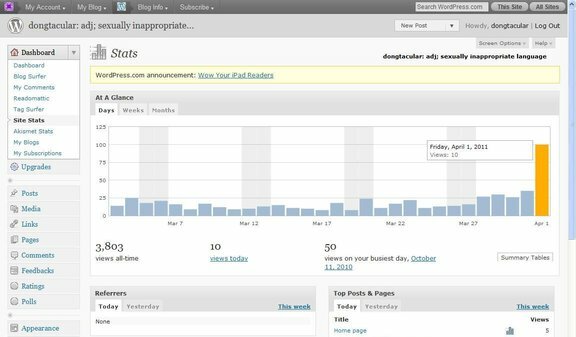 This entry was posted in Semi-Serious and tagged april fools, blogging, humor, prank, satire, stats, website, wordpress. Bookmark the permalink. 10 Responses to April Fools! You Got Me, WordPress! Any “Like” is a good “Like” ! Thanks! Yes, I did post some signs with my blog address on them. But that’s a story for another day. I was hoping I wasn’t the only one who noticed, and I thought tagging my post with “april fools” and “wordpress” may throw some hits my way. Thanks for reading! I had exactly the same reaction. Grrrrrrrr! Don’t be angry, just don’t fall for it again! You should obsessively check your stats multiple times a day like I do. You can hope for another good prank next year! I know that one of my friends got duped by this as well. Did you just like, go away, forever?